to get instant updates about 'North East Delhi' on your MyPage. Meet other similar minded people. Its Free! North East Delhi is an administrative district of the National Capital Territory of Delhi in India.North East Delhi is bounded by the Yamuna River on the west, Ghaziabad District of Uttar Pradesh state to the north and east, East Delhi to the south, and North Delhi to the west across the Yamuna. 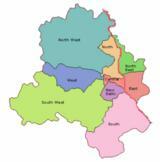 North East Delhi has an total area of 60&nbsp;km². The Majority of population follow hinduism. But it also have very large Muslim and jain poulation, many christians and few bahai followers also live here.Hindustani language is the principal spoken language while English is the principal written language of the city. Other languages commonly spoken in the area are dialects of Hindi, Punjabi and Urdu. North East delhi is a middle class residential area. Majority of the population is indulge in self-businesses, the area comprise some of the major markets of delhi, like Chota Bajar,Rohtas Nagar,Bhajanpura,etc. Since few years the area witness rapid economic growth. Many government schemes have been planted here within short time period.